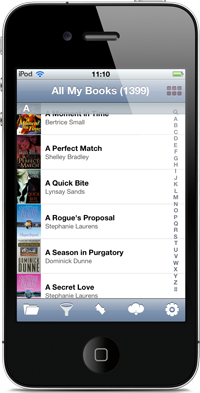 So, you decided to transfer your book collection from All My Books for Windows® to mobile All My Books on your iPhone, iPad or iPod Touch using the local file. This way is for those who hasn't quick (or cheap!) Internet connection both on desktop and mobile device. 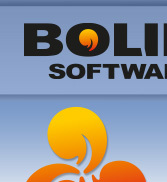 All My Books software version 3.3 or up installed. You can check the version number using menu item "Help-About" in the program. 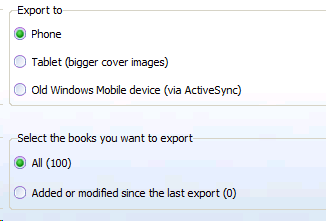 Select the export options. For higher cover images resolution select export to Tablet. If you want to update the existing collection you may select "Added or modified since the last export" option and save your time and traffic. You can see the number of books in brackets. Press "Start" button and wait for program to prepare the export file. When the file is ready, the program will ask for the folder where to save it. Remember that folder. You will need it in the further steps. Connect your mobile device (iPhone, iPad or iPod Touch) to your computer using USB-cable. 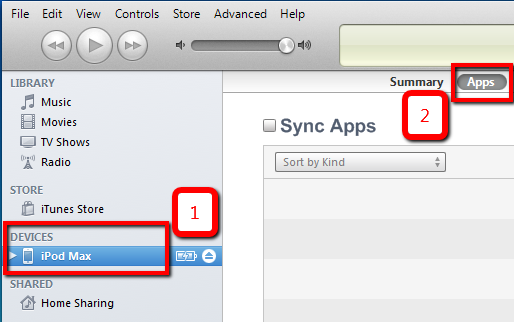 Start iTunes. 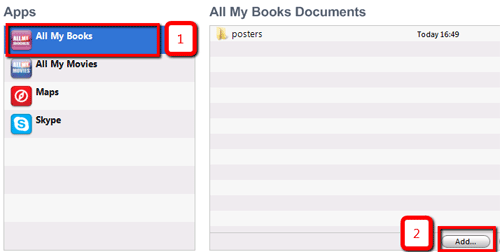 Select All My Books app (1), Click on "Add..." button (2) there and select the saved amb.zip file from the folder you should remember from the previous steps.